We are all exposed to air pollution to some degree. Oxides of nitrogen and particles emitted by road vehicles, trains and ships affect not just the frail, but all of us throughout our lives. These pollutants seriously harm health: they are linked with cancer, heart disease, obesity and dementia. The Royal College of Physicians states that 40,000 deaths each year in the UK are attributable to outdoor air pollution. The Royal Society of Biology organised an event this week to discuss the effects of air pollution on health. At the event, Professor Barbara Maher of the University of Lancaster spoke about particulate pollution produced by vehicles that can enter the brain when breathed in through the nose. The particles are formed of iron-rich magnetite. They induce damaging reactive oxygen species, and investigations are underway about potential links with Alzheimer’s disease. How can individuals reduce air pollution and protect themselves? People can reduce their own contributions to air pollution by improving the energy efficiency of homes, and by walking, cycling or using public transport instead of travelling by car. To reduce exposure to particulate pollution, Professor Maher shared several tips. Maintaining space from the vehicle ahead when stuck in traffic reduces exposure for drivers and passengers. When walking, the pavement edge furthest from traffic is less polluted than the kerb, and the side of the road on which traffic drives downhill is less polluted than the uphill side. Walkers can also reduce exposure by avoiding main roads, and the use of online route planners can help with finding quieter alternatives. What can government do to tackle air pollution? 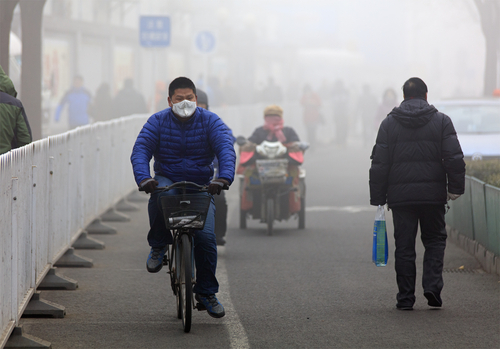 Professor Maher noted that policy to address air pollution has, until recently, focussed on reducing a number called PM10 – the number of particles with a diameter of up to 10 micrometres (or a hundredth of a millimetre). An unintended consequence of this policy is that vehicles now emit much smaller particles that can penetrate further into the body, with more insidious effects. This case highlights the need to gather a breadth of appropriate evidence before implementing policy. Reducing air pollution needs action on several fronts. Urban trees contribute to cleaner air, as well as boosting our happiness. We should also welcome schemes that encourage cycling and walking as alternatives to journeys made by petrol- and diesel-powered cars. Replacing polluting buses and taxis with battery- or hydrogen-powered models will also improve air quality, and the Mayor of London this week announced plans to do so. However, it is disappointing that UK cities are yet to follow the lead of Paris, Madrid, Athens and Mexico City, which last week pledged to ban diesel cars by 2025. In the 1950s and 60s, the UK led the world on action to reduce smogs caused by coal, with the Clean Air Acts. Until more is done to clean up our air, we should not necessarily let our elected officials breathe easy. Read more about the #GreySkyResearch event on our website: Invisible air pollution becoming harder to detect.